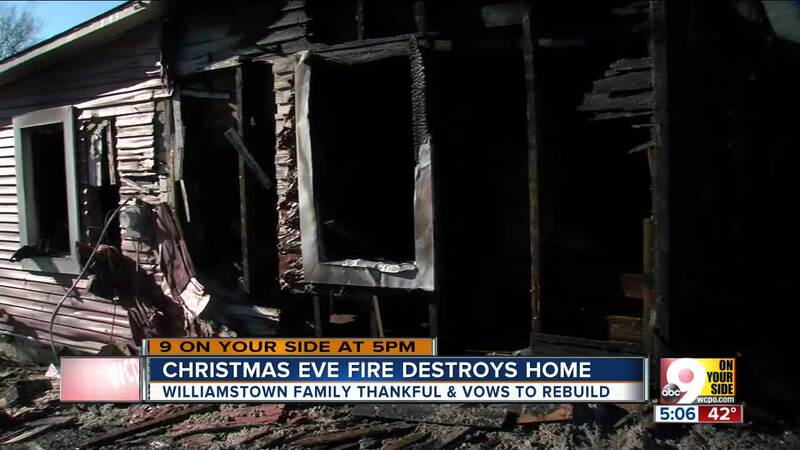 WILLIAMSTOWN, Ky. — A Williamstown homeowner says he'll rebuild his home after it was destroyed in a fire on Christmas Eve. Tommy Judd said his wife woke him at about 7 a.m. Monday when she saw smoke. The couple ran outside without grabbing any of their possessions as smoke quickly filled their Falmouth Street home. "There's nothing in here that can't be replaced," Judd said, standing beside the burned-out building. "As long as we're alive, we're good to go." The house is "a total loss," according to Judd, but he remained positive about his future, and grateful to the firefighters who came out in the cold to knock down the flames. Judd said he and his wife already have a place to stay in town and will celebrate Christmas with his siblings. "[I] feel very blessed," he said. "We've got friends, family. We've already got a place to live. Insurance is here, taking care of us. We're already good to go ... I'll build back."